You might look at your kitchen, bedroom, even your bathroom, and only see a messy disaster. But photographer Menno Aden doesn't. He sees a work of art. 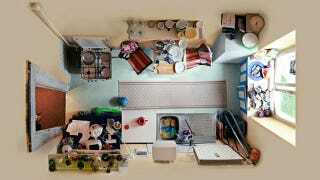 Except that it probably helps that he photographs various rooms from the ceiling with a unique top-down perspective.